UPDATED: Mon., Feb. 11, 2019, 9:15 p.m.
OLYMPIA – Called to work at 3 a.m. Monday, Ryan Carter decided to take his snowboard to his job in Olympia, where he spent most of the morning shoveling snow off the roofs. Cut loose shortly before noon, he headed for the steepest incline in the city: The 42 steps at the north entrance of the domed Legislative Building on the Capitol Campus. There he made several runs and had paused to build up a ramp of snow to catch a bit of air when three members of the Washington State Patrol, which provides security for the building, intervened. Carter argued he was a taxpayer, to no avail. Troopers, after all, have heard that excuse plenty of times in plenty of situations, and were unswayed. They were concerned he would break something. In friendly but no nonsense tones, they sent him on his way. He looked across to the Temple of Justice – fewer steps but just as steep – but the troopers remained at the top of the north steps, and he turned to leave. “I might be back tomorrow,” he said with a smile, and shouldered his board. The north steps are often among the most crowded spots at the Capitol during a legislative session. Groups trying to convince lawmakers to do something, or to stop doing something else, gather there by the hundreds and sometimes thousands, with microphones and speakers, placards and banners. But not Monday. It was a snow day at the Capitol; all committee hearings were canceled. Many legislators and staff who arrived in the morning were sweeping off their cars and heading home by lunchtime. Groups that had planned conferences or other meetings nixed those as well. Gov. Jay Inslee canceled his morning news conference, although he did go up to Seattle to join with Seattle and King County officials to congratulate local motorists for being smart about keeping off the road over the weekend. They asked residents to keep it up as more snow, likely followed by rain, possibly by freezing rain, was in the forecast. That left the Capitol to a few hearty souls like Carter who took advantage of a rare South Sound snowfall by cross-country skiing on sidewalks that were snowed over a few minutes after they were cleared, sledding down small hills or building forts or snow persons in the white expanse near the Tivoli Fountain. Others just walked to enjoy the unusual views, like snow clusters on the flags next to the names of the fallen at the Vietnam Veterans Memorial or the white shroud on the Winged Victory statue that commemorates those who served in World War I. The schedule for Tuesday is uncertain. 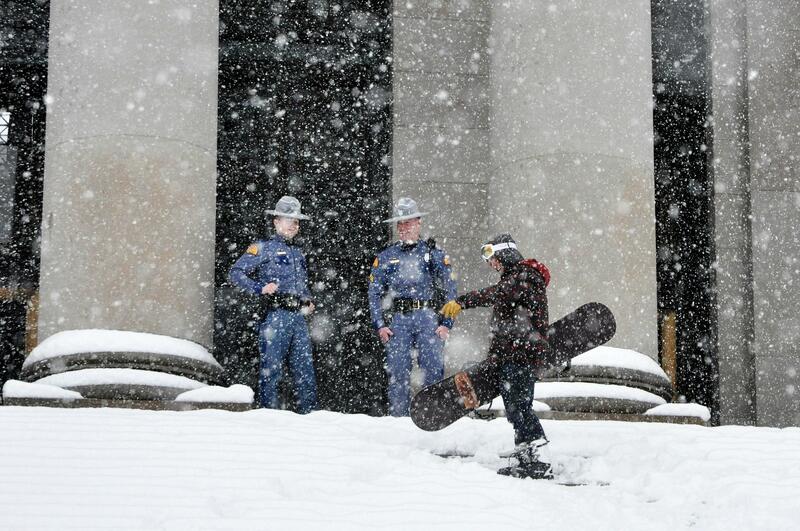 But if a second snow day gives Carter or other boarders designs on the Capitol steps, the State Patrol will likely be ready for them. Published: Feb. 11, 2019, 4:19 p.m. Updated: Feb. 11, 2019, 9:15 p.m.